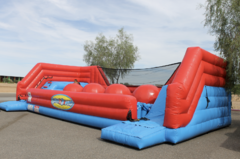 Obstacle course rentals are the perfect choice for large event due to the high throughput these units offer. Dual lanes will keep the action moving, making them ideal for schools, churches, and company picnics. Watch as contenders crawl through tunnels, navigate popup barriers, scramble up the climb & slide. Great fun for ages, including spectators! All of our obstacle course rentals are cleaned and sanitized before every rental and are manufactured from "lead-free" vinyl for child's and guest's safety. Browse the selections below and click on the image or the "more Info" link to get additional information and to make a reservation.